Qatar's embassies and diplomatic missions marked the National Day, which is celebrated on December 18 of every year, in commemoration of the state's founder Sheikh Jassim bin Mohamed bin Thani, under the theme "as long as it was proven by our deeds...Qatar Will Remain Free." Their Excellencies, Heads of Diplomatic, Consular and Representative Missions of Qatar abroad, extended greetings and congratulations to His Highness the Amir Sheikh Tamim bin Hamad al-Thani, His Highness the Father Amir Sheikh Hamad bin Khalifa al-Thani, and the Qatari people on this occasion, wishing Qatar further progress and prosperity. The Qatari diplomatic celebrations in the capitals and cities of the world were attended by a high level official and public representation that reflected Qatar's distinguished relations with these countries. 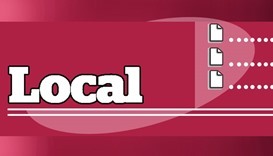 In New York, The Permanent Delegation of Qatar to the United Nations in New York hosted a reception marking the National Day at the Lincoln Cultural Centre. 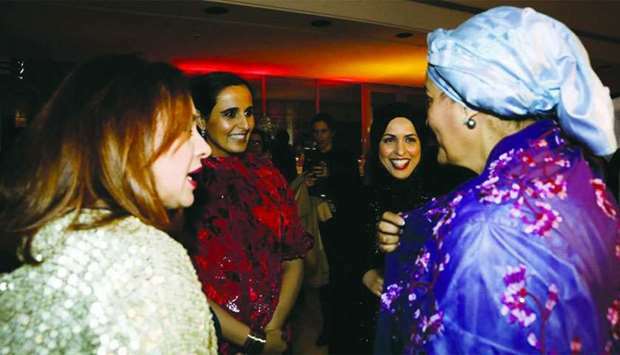 The reception was attended by Chairperson of Qatar Museums, Doha Film Institute, and Founder of Reach Out to Asia HE Sheikha Al Mayassa bint Hamad al-Thani. It was also attended by High Representative for the United Nations Alliance of Civilizations, Nasser bin Abdulaziz al-Nasr, Deputy Secretary-General of the United Nations Amina Mohamed, President of the United Nations General Assembly Maria Fernanda Espinosa, and US Representative from New York, Carolyn Maloney. HE Permanent Representative of Qatar to the United Nations, Sheikha Alya Ahmed bin Saif al-Thani, welcomed the guests, and said in a speech that the National Day is a very special occasion for the Qatari people, as the founder of Qatar, Sheikh Jassim bin Mohamed bin Thani, united the country on the day in 1878, before it ultimately gained independence in 1971. She reviewed the achievements of Qatar in education, sustainable energy, sports, and arts. She noted that Qatar has invested mainly in its people, as mentioned in Qatar National Vision which aims to transform the economy into a knowledge-based one. For her part, HE the Chairperson of Qatar Museums Sheikha Al Mayassa bint Hamad al-Thani congratulated His Highness the Amir Sheikh Tamim bin Hamad al-Thani. She said that keeping this memory alive is a tribute to founding moment of the modern Qatari state. She reviewed the achievements made by Qatar in the areas of economic development, education and enhancing the role and status of women. Sheikha Mayassa highlighted the rights enjoyed by women in the fields of employment, wages, equal opportunities and the high-ranking positions as well as their role in the national economy. She discussed Qatar's interest in arts and heritage, and focused on the national museum that will be opened in the Spring of 2019. She described the museum as an embodiment of Qataris' pride in their national identity, and a bridge linking the past and history to the present in all its diversity and openness to the world. Sheikha Mayassa also said that the museum was a testament to the country's continued investment in arts. She also highlighted the blockade imposed by some neighbouring states based on unfounded allegations, and said that the blockade helped unite the people and residents of Qatar around the leadership and government of the country. 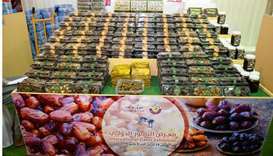 Meanwhile, HE al-Nasr said: "Celebrating the National Day reminded us of the achievements of Qatar. He added that Qatar is a small country in terms of geography, but one that has made great achievements in the last 30 years in many fields, such as education. He also focused on Qatar's hosting of the World Cup 2022 for the first time in the Arab region. Qatari music composer Dana al-Fardan introduced Qatari artist Aisha Sayed al-Zayani and Juilliard Orchestra who played a number of national songs. A large number of permanent representatives of UN member-states attended the ceremony along with representatives of consular missions in New York, a large number of diplomatic corps members and staff of UN. The country's embassy in the United States hosted a reception on the occasion of Qatar National Day at the Library of Congress. 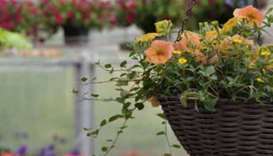 More than a thousand people attended the function. Ambassador Sheikh Mesha'al bin Hamad al-Thani welcomed a number of ranking officials at the US administration and at the US Congress led by the candidate for majority leader Nancy Pelosi, Scott Taylor, Ruben Gallego, Sheila Jackson Lee, and a number of former congressmen such as Nick Rahall, and Jim Moran, in addition to diplomats and Qatari citizens and student in the US. 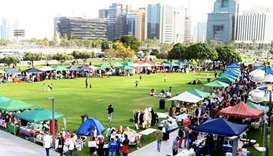 The ambassador said that the National Day celebration is an occasion for Qataris to express their pride at their culture and traditions. He expressed gratitude to representatives Nancy Pelosi, Scott Taylor, and Ruben Gallego who focused on the importance of the strategic partnership between the two countries as they share goals of establishing peace, stability, and prosperity for the two peoples. The ambassador explained that the two countries have come a long way since they established diplomatic relations 46 years ago. Over the past two decades, relations between Qatar and the United States of America have been strengthened at all levels. The ambassador stressed that Qatar and the United States enjoy a strong partnership in various sectors, especially in the cultural, political, defence, counter-terrorism, trade and investment fields. The ambassador also announced that the two sides will hold their annual strategic dialogue next month, as they look to give ties in all fields a push. He stressed that ties go beyond the military sector and extend to economy and trade, with Qatar becoming one of the main economic partners of the United States in the Middle-East. In the context of economic partnership, the ambassador highlighted the announcement made by the Qatar Investment Authority (QIA) and pledged to invest $45bn in the US economy by 2020 in key sectors such as infrastructure, technology and real estate. He also discussed QP's announcement of investing $20bn in American oil and gas fields over the next five years. For her part, Congresswoman Nancy Pelosi praised in her speech during the ceremony the role played by the ambassador in improving ties between Qatar and the US. Taylor noted that Her Highness Sheikha Moza succeeded on the cultural level in establishing important institutions such as Qatar Foundation, which hosts six American universities. As for security cooperation, he said that billions of dollars were spent to counter-terrorism. He also highlighted Qatar's announcement of plans to expand the military base, thanking Qatar for hosting 13,000 US and coalition troops in the biggest airbase in the region. Gallego meanwhile stressed that it was important for the United States to have a strong and independent partner like Qatar. The ceremony also included showing video clips of Qatar's aim to realise Qatar National Vision 2030. Meanwhile, the Consul General of Qatar in Los Angeles Khalid bin Yousif Al Sada hosted a reception ceremony on the occasion of the National Day. The ceremony was attended by representatives of the Government of California and Los Angeles, the heads of diplomatic missions accredited to Los Angeles, as well as a large number of dignitaries and executives of some companies, businessmen and Qatari citizens in the city, in addition to Assistant Military Attache to the US, Captain Nasser bin Mohamed al-Thani. In a speech, the Consul General of Qatar in Los Angeles praised the friendly relations between the State of Qatar and the United States and Qatar's comprehensive renaissance at all levels under the wise leadership and patronage of HH the Amir. In London, ambassador of Qatar to the United Kingdom, Youssef bin Ali al-Khater held a reception on the occasion of Qatar's National Day. The function was attended by Minister of State for the Middle East and North Africa Alistair Burt, Parliamentary Under Secretary of State for Defence People and Veterans Tobias Ellwood, and Member of Parliament Alistair Carmichael. In addition to a number of Arab and foreign ambassadors, media personalities, businessmen, and academics who also attended. In Brussels, Qatar's ambassador to Belgium and head of its missions to the European Union and the North Atlantic Treaty Organisation (Nato) Abdulrahman bin Mohamed al-Khulaifi held a reception on the occasion of the National Day. The function was attended by a number of ranking officials, and heads of Arab and foreign diplomatic missions. In a speech, al-Khulaifi reviewed the development of bilateral relations between Qatar, Belgium, the European Union and Nato, and the momentum created by the official visit of His Highness the Amir Sheikh Tamim bin Hamad al-Thani to Belgium last March, which was an opportunity to sign a number of agreements. He also stressed that the year witnessed the continuation of Qatar's path towards prosperity, development, economic diversification and self-reliance under the leadership of His Highness the Amir. The ambassador praised Qatar for carrying out a number of reforms and passing legislation that were the first of their kind in the region, saying the country set an example for respect for and protection of fundamental rights. In Khartoum, Qatar's ambassador to Sudan Abdulrahman bin Ali al-Kubaisi held a reception on the occasion of the National Day of the State. The ceremony was attended by Representative of the Sudanese President and Minister of Oil and Gas Minister Azhari Abdulqader and a number of ambassadors, military attaches and political and intellectual leaders. Al-Kubaisi said in a speech that Qatar has achieved a comprehensive renaissance in all walks of life and the prospects for a promising future, reviewing the State's rich history of achievements in this regard. The ambassador pointed to the efforts of His Highness the Amir Sheikh Tamim bin Hamad al-Thani to complete the great Qatari march to build a modern state, taking its place among the developed countries as an active member in all regional and international forums. In his speech, Azhari Abdulqader praised the Qatari-Sudanese relations and the development witnessed in various fields. He affirmed Sudan's keenness to support and consolidate these relations in the interest of both countries and peoples. 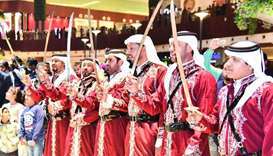 The ceremony included cultural shows, which provided a detailed definition of the past and present of the State of Qatar and its achievements in Sudan and its working institutions. Ambassador of Qatar to India Mohamed bin Khater al-Khater held a reception on the occasion of National Day in Delhi. The ceremony was attended by India's Minister of State for External Affairs Vijay Kumar Singh as guest of honour, representative of the Indian government, a number of Indian officials, political and intellectual figures as well as business leaders, heads of diplomatic missions accredited to New Delhi, corporate executives, journalists, media and business representatives, civil society leaders and clerics. Qatar's ambassador to Philippines Ali bin Ibrahim al-Malki held a reception on the occasion of the National Day of the State in Manila. The ceremony was attended by Assistant Secretary at the Office of Middle East and African Affairs of the Foreign Ministry of the Philippines Leslie Baja, as honorary guest, Chief of Presidential Protocol Robert Eric Borje, representing the Philippine President, and Philippine Senator Aquilino Pimentel III in addition to a number of heads and members of diplomatic missions and international organizations accredited to the Philippines, Philippine Foreign Ministry officials and businessmen. The ceremony included a documentary video showing the history of Qatar and the comprehensive renaissance it has achieved in various fields. On the sidelines of the ceremony was a mini-exhibition of photographs, which includes pictures of the landmarks of the renaissance of development in Qatar and preparations for hosting the 2022 World Cup. 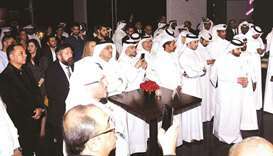 In Dhaka, ambassador of Qatar Ahmed bin Mohamed al-Dhaimi, held a reception on the occasion of the Qatar National Day. A number of government officials, politicians, businessmen and a number of members of the diplomatic corps accredited to Bangladesh, attended the ceremony. Qatar Airways and Qatar Charity participated in the ceremony with films and photographs on the history of Qatar. In Ottawa, ambassador of Qatar to Canada Saoud bin Abdullah al-Mahmoud held a reception ceremony to mark National Day celebrations. The function was attended by a number of military leaders, parliament members, diplomatic representatives accredited by Canada, academics, journalists, members of the Arab communities in Canada, and Qatari students who are pursuing their education in the country. In a speech, the ambassador reviewed the reality of the bilateral relations between Qatar and Canada and the efforts exerted by officials at the level of the two countries to enhance them and develop prospects for co-operation in various fields. 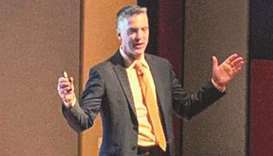 He said that there are a number of Canadian citizens engaging currently in projects in Qatar in many sectors such as education, health, and industry. 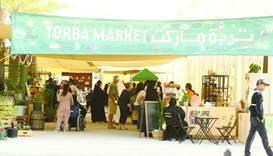 The ambassador also discussed the strong economic indicators of Qatar, despite facing the blockade for more than a year. The Qatari embassy in Bangkok held a reception on the occasion of the National Day. The event was attended by Adviser to the king of Thailand, a number of officials, public figures and businessmen, heads and members of diplomatic missions and regional, international and regional organisations accredited to Thailand, along with embassy members and a number of Qatari nationals in Thailand. Ambassador HE Sheikh Jassim bin Abdulrahman al-Thani said in his speech that this year's theme, taken from the national anthem, was the best portrayal of the crucial time the country is facing in its history. In the capital of Kyrgyz Republic, Bishkek, ambassador of Qatar to the country, Abdullah bin Ahmed al-Sulaiti held a reception on the occasion of Qatar National Day. The ceremony was attended by the Deputy Foreign Affairs Minister of the Kyrgyz Republic Nurlan Abdrakhmanov, Minister of Labour and Social Development of the Kyrgyz Republic Ulukbek Kochkorov, a number of government officials and heads of diplomatic missions and consulates accredited to Kyrgyzstan. In his speech, the ambassador spoke about the unjust siege imposed by the Saudi-led quartet since June 2017. He touched on the reasons behind the crisis and Qatar's contributions to combating terrorism. For his part, the Deputy Foreign Affairs Minister congratulated Qatar on its National Day, pointing to the development of the relations between both countries and his country's interest in activating trade, economic and investment co-operation with Qatar. In Nicosia, ambassador of Qatar Sultan bin Ibrahim al-Mahmoud, hosted a reception ceremony on the occasion of Qatar National Day. The ceremony was attended by Acting President of Cyprus Demetris Syllouris, who is also president of the House of Representatives and to represent the Cypriot government, Minister of Energy, Commerce, Industry and Tourism Giorgos Lakkotrypis participated. A number of officials from Cyprus, ambassadors of Arab and foreign countries accredited to Cyprus and several businessmen attended the ceremony. In Bucharest, the Qatari embassy hosted a ceremony on the occasion of Qatar National Day. The ceremony was attended by Deputy Prime Minister of Romania Viorel Stefan, the ministers of foreign affairs, defence, health and agriculture, a number of parliament members, senior officials, heads of diplomatic missions, media personnel and businessmen. In Budapest, ambassador Qatar to Hungary Mohamed bin Hamad al-Khalifa hosted a reception on the occasion of Qatar National Day. The reception was attended by Deputy State Secretary for Economic Foreign Affairs Dr Petra Pana, a number of parliament members and military officials. In Canberra, ambassador of Qatar to Australia Saad bin Abdullah al-Mohamoud held a reception on the occasion of Qatar National Day. The event was attended by a number Australian officials representing different governmental sectors, parliament members, ambassadors of friendly countries accredited to Australia. 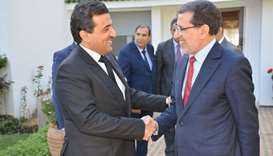 In Rabat, Qatar's ambassador to Morocco, Abdulla bin Falah al-Dosari, held a reception on the occasion of the of Qatar's National Day. In Quito, ambassador of Qatar to Ecuador Mohamed bin Ali al Malki held a reception ceremony to mark National Day celebrations. Attending the function were Minister of Tourism Rosi Prado de Holguin, Assistant Minister of Foreign Affairs Andreas Tiran, Director of Protocoal Juan Holguin, along with members of the Arab and Muslim community in Quito. In Asuncion, Charge D'Affaires of Qatar to Paraguay Abdulrahman Ahmed al-Suwaidi held a reception ceremony to celebrate the National Day. The ceremony was attended by Bernardino Caballero, who represented the Minister of Foreign Affairs, in addition to a number of prominent political figures, senate and parliament members, heads of diplomatic missions accredited by Paraguay. In a speech, al-Suwaidi gave a brief overview on Qatar's Foreign Policy Principles. He also discussed the unfair blockade imposed on Qatar, and the country's clear position that any dialogue to end the crisis must be unconditional. He also discussed the strength of the Qatari economy, and bilateral ties with Paraguay. In Chisinau, Charge D'Affaires of Qatar to Moldova Hamad bin Rashid al-Athba held a reception ceremony to mark National Day celebrations. A representative of the Moldovan presidency attended the ceremony, along with undersecretary of the Ministry of Foreign Affairs, Vice-President of the parliament Valeriu Ghiletchi, members of parliaments, government officials, and heads of diplomatic missions accredited by the state. In Naypyidaw, Charge D'Affaires of Qatar Mansour bin Mubarak al-Khayarain in Myanmar held a reception ceremony to mark Nday Delebrations. Minister for Planning and Finance of Myanmar Soe Win attended as the guest of honour of the ceremony, along with a number of ranking government officials and heads of diplomatic missions accredited by the state. In San Jose, Qatar's ambassador to Costa Rica Mohamed bin Kurdi al-Marri held a reception ceremony to celebrate the National Day. First Vice-President of Costa Rica and Minister of Foreign Affairs Epsy Campbell Barr attended the function, along with Minister of Communications Juan Carlos Mendoza, Minister of Justice and Peace Marcia Gonzalez Aguiluz, HE Minister of Sport Hernan Solano Venegas, Science, Technology and Communications Minister Luis Adrian Salazar, Minister of Housing Irene Campos Gomez, a number of high-ranking government officials, and representatives from diplomatic missions accredited by Costa Rica. The ambassador discussed in a speech the resilience of Qatar after more than a year-and-a-half of the blockade, which proved the extent of cohesion of the people of Qatar and their loyalty to the leader His Highness the Amir Sheikh Tamim bin Hamad al-Thani. The Costa Rican vice-president congratulated the Qatari government and people on the occasion. In Berlin, Qatar's ambassador to Germany, Sheikh Saud bin Abdulrahman al-Thani, hosted a reception on the occasion of Qatar National Day. The function was attended by more than 400 senior representatives of official political, parliamentary, diplomatic and economic institutions as well as a number of heads of diplomatic missions accredited to Germany and Qatari nationals in Germany. In his speech during the ceremony, ambassador Sheikh Saud bin Abdulrahman al-Thani, underlined the significance of the commemoration of the founding of Qatar by the founder Sheikh Jassim bin Mohamed bin Thani. He said the celebration of the National Day is a celebration of the achievements made through the process of construction and development to date, under the leadership of His Highness the Amir Sheikh Tamim bin Hamad al-Thani, he added. In Sweden, Qatar's Charge D'affaires Ali bin Mutlaq al-Hajri held a reception to celebrate the National Day in Stockholm. The reception was attended by director of protocol at the Ministry of Foreign Affairs, and a number of heads and representatives of diplomatic missions. Ambassador Sultan bin Salmeen al Mansouri hosted a reception ceremony on the occasion of Qatar National Day in Beijing. The celebration also coincided with the 30th anniversary of establishing diplomatic relations. The event was attended by Vice-Chairman of the Standing Committee at National People's Congress and President of China-Arab Friendship Association Arken Imirbaki, a number of ranking officials of the Ministry of Foreign Affairs, the Communist party, as well officials from the National Development and Reform Commission of the People's Republic of China, and representatives of Qatari banks in China, students who study in the country, oil and gas companies, and major oil corporations. The embassy of Qatar in Seoul held a reception on the occasion of the National Day. The ceremony was attended by Deputy Minister of Health as a representative of the Korean government, in addition to foreign ministry officials, members of parliament, heads of Arab and foreign diplomatic missions, heads of international organizations and agencies operating in the country, a group of businessmen and representatives of Korean companies, Media and public figures. 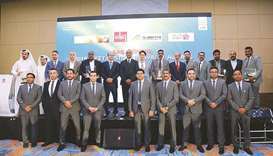 HE Ambassador of Qatar to South Korea Mohammed bin Abdullah Al Duhaimi said in his speech that ties with Korea remain distinguished ones in the political and commerce field. He praised the efforts of the Korean government in establishing peace on the Korean Peninsula. He stressed that the State of Qatar has fulfilled its full commitments in the field of energy towards the Republic of Korea and the world despite the unjust siege imposed on it. For his part, the representative of the Korean government congratulated the State of Qatar on its national day celebrations, and praised cooperation between the two sides in the medical field. The Embassy held a special exhibition for the World Cup 2022, during the reception, which showed pictures of the stadiums and audio-visual materials showing the stages of establishing the stadiums and preparations underway in full swing for the success of organizing this event. In the Republic of Kenya, the Embassy of the State of Qatar celebrated the National Day in the city of Nairobi. Attending the reception were former Vice-President of Kenya Kalonzo Musyoka, first undersecretary of the ministry of foreign affairs, the ministry of foreign affairs officials, members of parliaments, heads of missions accredited by Kenya, and international officials in organizations such as the United Nations. In the Republic of Macedonia, the Charge D'affaires hosted a reception on the occasion of the National Day in Skopje. The ceremony was attended by Speaker of the Macedonian parliament Talat Xhaferi, a number of senior government officials, heads of diplomatic missions accredited by Macedonia. In Accra, HE Qatar's Ambassador to the Republic of Ghana Mohammed bin Ahmed Al Hamid hosted a reception ceremony to mark national day celebrations. Minister of Muslim communities in Ghana Moustafa Abdulhamid attended as a representative of the government, in addition to ranking officials from the presidency and government, as well as members of the Parliament. In El Salvador, the embassy hosted a reception ceremony on the occasion of Qatar National Day. The ceremony was attended by HE Minister of Foreign Affairs Carlos Castaneda, judge at the Supreme court of justice Oscar Armando Pineda, HE Minister of Finance Nelson Fuentes, HE Defense Minister David Munguia Payes, HE Minister of Culture Silvia Elena Regalado, HE Minister of Education and Higher Education Carlos Mauricio Canjura, members of parliaments, judges at the constitutional court, and heads of diplomatic missions accredited by Elsalvador. and a number of ranking officials and business personalities. The Embassy of the State of Qatar to the Republic of Peru held a reception on the occasion of the National Day of the State in the capital Lima. The ceremony was attended by HE Peruvian Foreign Minister Nestor Popolizio, HE Peruvian former Prime Minister Luis Solari, HE Director of Africa, Middle East and Gulf Countries Sector of the Peruvian Foreign Ministry Ambassador Gustavo Otero, senior officials and heads of diplomatic missions to Peru. HE Ambassador of the State of Qatar to the Republic of Peru Ali bin Hamad Al Sulaiti thanked HE the Minister of Foreign Affairs of Peru and the audience for taking part in the celebration of the National Day of the State of Qatar. In Tirana, HE Qatar's Ambassador to the Republic of Albania Ali bin Hamad Al Marri held a reception on the occasion of the National Day of the State. The ceremony was attended by HE Speaker of the Albanian Parliament Gramoz Ruci, representing the Albanian government, in addition to, senior government officials, MPs, members of the Arab and foreign diplomatic corps accredited to Albania, as well as businessmen, media and culture. In Hong Kong, HE Consul General of the State of Qatar in Hong Kong Mohammed bin Sultan Al Kuwari held a reception on the occasion of the National Day of the State. The ceremony was attended by HE Secretary for Justice of Hong Kong Teresa Cheng as the guest of honor representing the Hong Kong's Government, HE Deputy Commissioner of the Chinese Ministry of Foreign Affairs in Hong Kong, and Chairman of Cathay Pacific John Slosar. In his speech, HE Consul General referred to the economic development witnessed by the State and the facilities provided for foreign investment, pointing to the development of bilateral relations between the State of Qatar and Hong Kong. 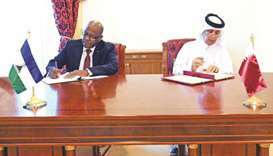 In Monrovia, Acting Charge d'Affaires at the Embassy of the State of Qatar in Liberia Fahad bin Rashid Al Muraikhi held a reception on the occasion of the National Day of the State. The ceremony was attended by Liberia's Acting Foreign Minister, Speaker of the Parliament, Minister of the Interior, Minister of Youth and a number of members of the diplomatic and consular corps and businessmen. The event included the screening of "Qatar the Future" and the display of the stadiums on which the 2022 World Cup will be held.